Why do people eat the flesh of animals? What motivates the slaughter of hundreds of millions of farm animals in the UK alone each year and the hauling of millions of fish from the sea? What could justify suffering on such a huge scale? People eat meat because they like the taste of it. Meat eating is encouraged by adverts, cookery books, TV programmes, and magazine articles. People are conditioned to eat meat as babies, as soon as they start eating solid food. It is not really questioned. This conditioning is reinforced at school and then by socialising as adults. You would probably choose not to eat a dog, yet will happily eat a pig. Yet dogs and pigs are of similar intelligence. In South Korea, eating dogs is not unusual. In Britain, eating cows is commonplace and acceptable. In India, it is not acceptable as the cow is considered to be a sacred animal. What might be one person’s dinner may be another’s pet dog or holy cow. How clearly have people thought about what they eat and why? Is there hypocrisy in our attitudes towards the suffering of animals? 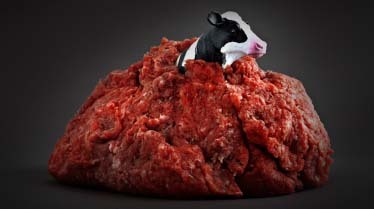 If you get upset about fox hunting, bullfighting, the killing of whales, or the poaching of elephants for ivory, do you take part in the slaughter of millions of cows and sheep as a consumer? Why is your variety of gaining pleasure through the exploitation of animals different from another person’s? We have a nervous system; this allows us to feel pain. Animals also have a nervous system, allowing them to feel pain. Plants do not. The traditional view of farming – i.e. that of animals grazing peacefully in green pastures – is far from today’s reality. Millions of animals are intensively farmed and spend all or most of their lives in cages, stalls, or windowless sheds. Of course there are still many farmers who care about their livestock, but they are under increasing pressure as part of a large industry intent on making money. We are not going to describe the conditions under which the larger farm animals may suffer on a farm. This has been done elsewhere and repeatedly filmed for television documentaries. 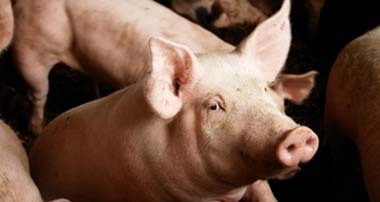 It is enough to state that the rearing of pigs is especially of concern, as it is mostly done intensively indoors. Under most field conditions, for cows and sheep, it is reasonable to state that any suffering is usually minimal during this rearing stage. To repeat, farmers generally care about their animals. Serious animal welfare concerns definitely begin, however, when the animals are ready to be transported to market or for slaughter. 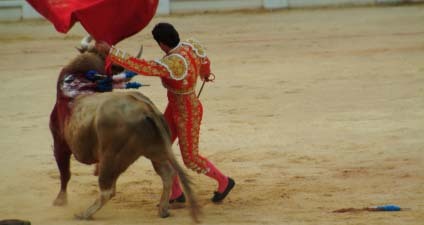 The loading process involves fear and panic; squealing and other noises suggest what the animals must be experiencing. Brute force often has to be used to “persuade” the animals to enter the transportation lorry (and again whilst off-loading at the abattoir). Conditions are, by financial necessity, cramped and obviously unnatural. The journey may be long or short; it may even involve international travel. Major concerns have to be focused on the actual slaughter process. By this point, the living animals are about to die and are treated as mere commodities on a conveyor belt. The process of stunning and/or killing these large animals is frequently inadequate and causes considerable pain and trauma. Those who work in slaughter houses unofficially admit that their job involves cutting corners and this has been filmed on many occasions. Worse still, the monotony of repeatedly killing animals can produce boredom and a sadistic attitude. Instances of individual workers intentionally inflicting pain on the already terrified animals definitely happens. Chicken has increasingly become a relatively cheap and popular food. 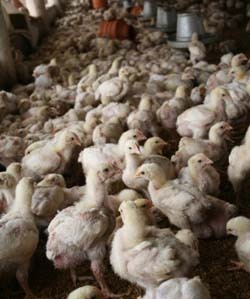 Broiler chickens are reared in modern chicken factories as quickly as possible. Again, time is money and money matters. The birds grow abnormally fast due to the feeding of growth-promoting drugs, additional lighting, and selective breeding. This abnormal growth rate results in many broken bones and heart problems. There are considerable animal welfare concerns throughout this production. The chickens are ready for slaughter within a matter of weeks, after which the process begins again. Battery eggs are produced by caged hens. Each hen has a space about the size of a telephone directory. They cannot move about properly or even turn around without difficulty. They stand on wire mesh floors. They cannot stretch or flap their wings. And these hens cannot carry out other natural behaviour such as perching, nesting, dustbathing, or scratching. The UK is planning to ban battery hens by 2012; meanwhile, some supermarkets are already phasing out battery eggs. Free-range eggs provide an alternative. 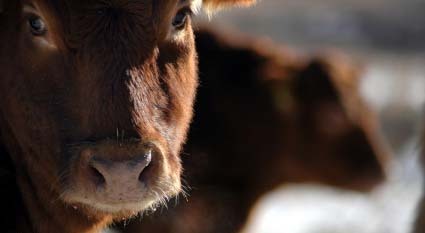 A range of serious diseases constantly threaten the livestock industry and result in periodic mass slaughter of livestock on farms or within local regions. These creatures do not even end up on someone’s plate. There are many notifiable diseases. BSE (or “mad cow disease”), foot and mouth disease, and avian influenza involving the H5N1 virus (“bird flu”) are just three well-known examples that have affected the UK in recent years. Two of these can cross to humans and cause death. Fish are one of the last wild animals that are extensively hunted across the world. Each year, many millions of tonnes of fish are hauled out of the seas. It is not only the fish that suffer; fishing nets also catch dolphins, porpoises, small whales, sharks, diving sea birds, shellfish, crabs, starfish, and many other creatures – as well as species of fish which are unwanted. Seals are commonly shot by fishermen because they eat “our” fish. The basic issue, however, is that we kill these creatures because we want to eat them. And make no mistake, if you are eating the flesh of an animal then you are killing it; technically, it is being killed for you, on your behalf, but this amounts to the same thing from an ethical consideration. You are part of the marketplace. An animal is being produced for you to eat it. A turkey, for example, may live for between 12 and 26 weeks until it is killed so that humans can enjoy their Christmas dinner; a turkey’s natural lifespan is approximately 10 years. So, is it ethical to kill and eat an animal (“food with a face”) when an alternative equally tasty and equally nutritious diet is available? This is the bottom line. This is the real question.